To learn more about how chlorine dioxide gas can help accommodate this application, sign up for our upcoming webinars on Isolator Decontamination and Comparing CD Gas vs. Hydrogen Peroxide Vapor taking place over the next few weeks. *They define indirect product contact parts as those that come into contact with items and components which do contact the product (i.e stoppers). Direct contact parts are those that the product passes through, such as pumps and filling needles. Chlorine dioxide (CD) gas can be utilized for a multitude of applications in the lab animal and life science industry. It is non-carcinogenic, residue-free, and safer on materials than bleach, ozone, hydrogen peroxide, and common liquid chlorine dioxide solutions. CD is not affected by environmental factors such as temperature, and is not subject to dew-point or condensation issues making it a versatile decontamination agent and allowing it to stay effective in all types of environments, including both ambient and vacuum pressure. Gaseous systems provide the ability to achieve a complete distribution and thorough penetration to each and every surface, including visible and invisible cracks and crevices. Some of the more common industry applications include animal holding rooms, BSL-3 and BSL-4 labs, biological safety cabinets, passthroughs, isolators, air handling units/ductwork, micro labs, and necropsy rooms. ClorDiSys' chlorine dioxide gas technology allows for a complete decontamination of your facility, with minimal equipment and minimal downtime. 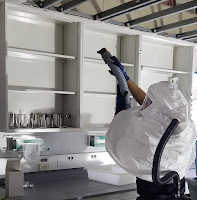 A 170,000 ft3 new university research facility was decontaminated upon completion of construction and prior to the commencement of operations. Equipment and supplies were brought into the space as well, so that they would be exposed and decontaminated concurrently. ClorDiSys was able to fumigate the facility and eliminate any organisms present while providing sporicidal kill of Biological Indicators (comprised of 1 million Bacillus atrophaeus spores) to ensure the process was successful. The entire process took two days, one day for setup and one day for decontamination and clean-up. A BSL-3 influenza laboratory undergoes a yearly decontamination using chlorine dioxide gas during a facility shutdown. All equipment is left within the space during the process, as the gas is safe on materials and will reach all surfaces within the lab. This provided a large time savings as each piece of equipment did not need to be treated individually in an autoclave or other pass-through system. Results are shown through the placement of 40 biological indicators as various locations throughout the lab. Some locations include closed drawers, inside and behind biological safety cabinets, underneath tabletop equipment, as well as easy locations such as floors, ceilings and walls. To learn more, attend our “Life Science and Pharmaceutical Facility Decontamination Services” webinar on Thursday, October 25th, visit Booth #1903 at the AALAS National Meeting in Baltimore, or visit our website’s Applications page. An electron microscope can be used to study dangerous biological organisms. Occasionally, the organism can be sucked into the internals of the microscope making it hazardous to repair with concern for the maintenance technician’s health. To mitigate these concerns, decontaminating the inside components of the microscope can be accomplished using gaseous chlorine dioxide with no adverse effect on the equipment. Some microscope manufacturers add a sixth step which is a pre-purge of the system with nitrogen. If a Pre-Purge step is used, the valves are opened and nitrogen is passed through the system. In 2009, ClorDiSys was approached by JEOL USA as they set forth to find a suitable decontamination method for their electron microscopes. They wanted a method to decontaminate the interior chambers to protect their service workers from the pathogens being studied within. Identical sets of parts were sent for material testing against chlorine dioxide and hydrogen peroxide vapor. According to “Construction and Organization of a BSL-3 Cryo-Electron Microscopy Laboratory at UTMB” in the December 2012 Journal of Structural Biology, their early attempts to use VHP with JEOL microscopes were not successful because of unacceptable level of corrosion of some parts inside the microscope column. Some showed visible discoloration and corrosion after the level of exposure necessary for a single decontamination cycle. Chlorine dioxide gas has a lower oxidation potential than ozone, peracetic acid, bleach and hydrogen peroxide, making it scientifically less corrosive than those other decontaminating agents. Our chlorine dioxide gas was selected due to its success in the material compatibility trials and is used with the $3 million TEM. Read more about the process and benefits of using chlorine dioxide for Electron Microscope decontamination in our application note.